The PushHog, a tree trimming device that fits between large trees and cuts through saplings up to three inches in diameter, won first place overall at the recent 2019 Won in One idea pitch competition hosted by Louisiana Tech’s Innovation Enterprise. 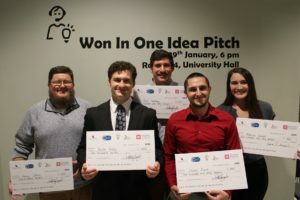 Winners of the 2019 Won in One idea pitch competition are (from left) Henry Cotton, Kevin Holly, Jack Smithey, Charles Franck, and Becca Doucet. The annual cash-prize competition is a chance for community members and students to share their innovative ideas. Each contestant has 60 seconds to present their concept or venture in an elevator-pitch format. After all 10 participants presented, evaluations were made by both the audience and judges. Kevin Holly, Director of the Laboratory Animal Facility at Tech, was the presenter for the PushHog. He said participating in Won in One gave his team several opportunities in advancing their product. He said he and his business partner have already used their $1,000 cash prize to pay off their first PushHog prototype. By participating in Won in One and making new connections at the event, Holly said they are looking forward to their business future. Other winners included Rebecca Doucet who won first place for best student pitch at Won in One. Henry Cotton, Jack Smithey and Charles Franck were also among those awarded for their innovative ideas. Rebecca Brady, a senior agricultural business major, was also a competitor in Won in One. She said by participating in this event, she gained a lot of new insight for improving her presentation skills. Brady’s idea pitch was Happy Paws, a local dog park for the Ruston and Tech community. She said her favorite part about Won in One was listening to the other competitors’ pitches alongside her own. 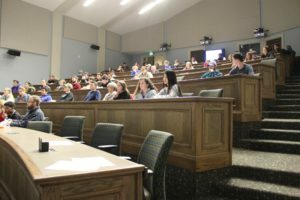 Kennedy Conlee, a junior chemical engineering major, was an audience attendee at the event. She said Won in One is beneficial to the community as it provides an opportunity for individuals to share their product ideas.